TerraX Minerals Inc. (TSX-V: TXR; Frankfurt: TX0; OTC Pink: TRXXF – http://www.commodity-tv.net/c/search_adv/?v=298245) is pleased to announce the completion of a helicopter-borne high resolution magnetic and radiometric survey over the Quyta-Bell property of the Yellowknife City Gold Project (YCGP). This 6409 line-kilometer survey was completed by Precision GeoSurveys Inc., of Langley, BC. A 434 square kilometer airborne LiDAR survey was also completed over the Quyta-Bell property by LiDAR Services International Inc. of Calgary, AB. Maps of the airborne geophysical and LiDAR coverage are available here. 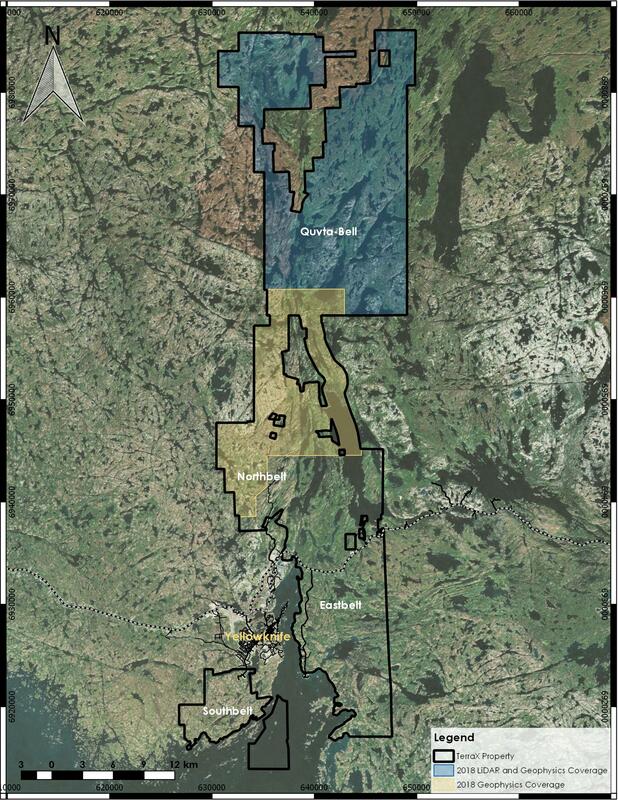 The YCGP lies on the prolific Yellowknife greenstone belt, covering 70 km of strike length along the main mineralized break in the Yellowknife gold district, including the southern and northern extensions of the shear system that hosted the high-grade Con and Giant gold mines. The project area contains multiple shears that are the recognized hosts for gold deposits in the Yellowknife gold district, with innumerable gold showings and recent high-grade drill results that serve to indicate the project’s potential as a world-class gold district. Rheinmetall has been supplying state-of-the-art training solutions ever since more than a decade, supporting numerous major military systems such as the NH90, EF2000, Tornado, MIG 29, Tiger, A400M and KC390, as well as civil projects like the EC135, A320 and EC145. The Düsseldorf-based Group’s extensive experience in the design, development, fabrication, maintenance and operation of military and civil flight training devices and flight training centres means that it is able to provide highly realistic aviation and mission training devices offering unrivalled value for money at low risk and in full compliance with all applicable regulations. Rheinmetall training solutions range in complexity from computer- based training systems (CBT) to FNPT, FTD, FFS and full-mission training systems, meeting even the most exacting customer requirements. Rheinmetall’s flexible approach means that it can upgrade any device at any time. In addition, Rheinmetall Defence Electronics offers different “operational feature modules” such as hoist trainer or door gunner which can be added to existing RME training systems at any time in order to conduct specialized training operations. Following in-depth consultation with the customer and an extensive training needs analysis, Rheinmetall has now embarked on a project to design, develop and manufacture a training device for the Airbus H145 M helicopter. Discovering new, future-oriented business potential requires more than just close and timely cooperation between customer and contractor. Far more, it calls for new forms of networked thinking and working. A partnership of equals is essential in Rheinmetall’s philosophy. Minimization of costs and maximization of returns to the customer is fundamental to Rheinmetall’s whole approach to business. This makes Rheinmetall a highly flexible partner, with an openminded attitude to future-oriented intelligent workshare. An example of the success of this strategy is EMBRAER’s decision to turn to Rheinmetall as a strong and reliable partner to design and deliver training devices for EMBRAER’s revolutionary new KC-390 aircraft, including cargo handling, procedure and maintenance trainers as well as flight and mission training systems, including full mission and flight simulators. Rheinmetall’s total commitment to the KC-390 programme laid the groundwork for successful, long-lasting cooperation between Embraer and Rheinmetall, which will definitely contribute to the overall success of the KC-390 programme. In order to assure maximum quality, Rheinmetall plans to partner with Airbus in the H145M training device project. The Rheinmetall team is dedicated to providing the most competitive solutions possible, meticulously tailored to the specific requirements of the H145M, resulting in fully compliant, high-performance training devices. Based on a high-performance 4×4 MAN truck chassis, the Survivor R is fitted with a steel armour cab. Capable of reaching speeds of over 100 km/h, the vehicle combines tried-and-tested automotive technology from major production runs with the latest force protection concepts from Rheinmetall. Rheinmetall has recently added two more modular components to its "VarioRay" family of laser light modules. The VarioRay LowProfile laser module and the separate "Lumenator" weapon lamp with 500-lumen illumination power provide the user with even greater tactical flexibility – despite their extremely small dimensions. The new products are key components for boosting the operational effectiveness of modern small arms. Moreover, visitors to the Rheinmetall stand at MILIPOL 2017 can learn about other members of the VarioRay family as well as the Group’s MultiRay MR 500 and MR 800 fire control aiming devices. Also on display is the TAC-Ray 1500 sniper build-on module with integrated ballistic computer. At MILIPOL, Rheinmetall is presenting several of its solutions in the realm of cyber security. These include -cyel equilibrium, which is based on the moving target approach, while the Group’s cyobs cyber radar measures, analyses and visualizes a country’s cyber vulnerability.